Gift Idea for Expecting Moms - The Pregegg! This post is brought to you by Pregegg. Are you expecting a baby or know someone who is??! Then I have the perfect cute little stocking stuffer or gift idea for them! Pregegg is a 'State of the Art’ accurate electronic counter that operates for the full length of your pregnancy on one CR2032 battery. PregEgg is a fun way to count down the days. Enter your due date and the clock begins! The egg slowly hatches until on the expected day, it opens to reveal a tiny chick. 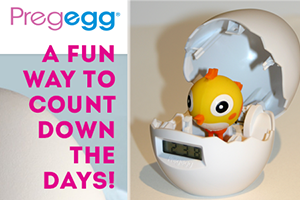 Pregegg™ is a clever 9-month countdown to your baby’s birthday with the display indicating the number of days remaining. Pregegg™ uses one long life CR2032 lithium battery which is included. Detailed instructions are included and the setup is quick and easy. The hatched stork is a perfect keepsake to represent the joy of your family’s newest addition! You can purchase the Pregegg for $19.99 from the Pregegg website.